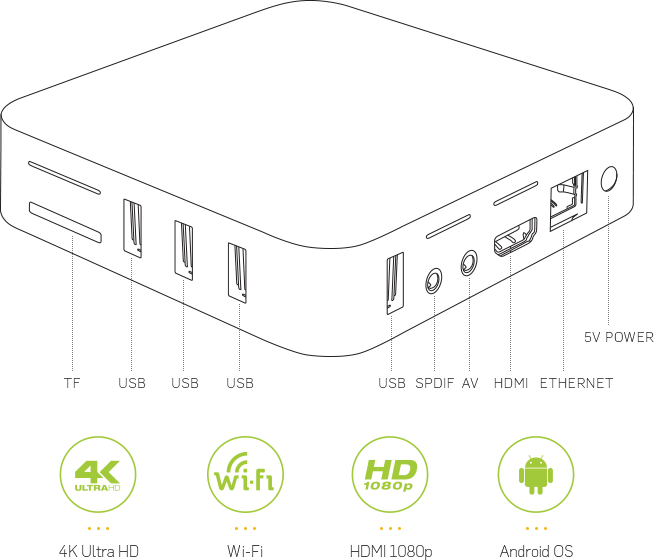 This revolutionary sleek Android media hub not only turns your TV smart, but allows you to stream your video and photo content, as well as the latest movies and television shows, directly to your TV, all in stunning 4K Ultra HD. TVHawk runs all your popular media services including Netflix, Hulu and YouTube. Import pictures into a library and browse the different views. You can start a slideshow, sort, and filter them, all from your TVHawk wireless mouse. TVHawk can play all your music, including AAC, MP3, FLAC, OGG, WAV, and WMA formats. It also has a cue sheet, tagging support, MusicBrainz integration, and smart playlists for full control over your music collection. TVHawk streams movies too! TVHawk supports all the main video formats and sources including streamable online media, ISOs, 3D, H.264, HEVC and WEBM. Using the latest software, the TV Show Library supports both episode and season views, as well as “watched tags”, show descriptions, and actor lists. Instantly stream any content available on the internet. Use your favorite browser to search the internet and view it all on your TV. imagery and enhanced media play and playback quality.